Card games have been a means of entertainment for centuries. Many different games use the same 52-card deck but with different rules, each game unique in its game play. 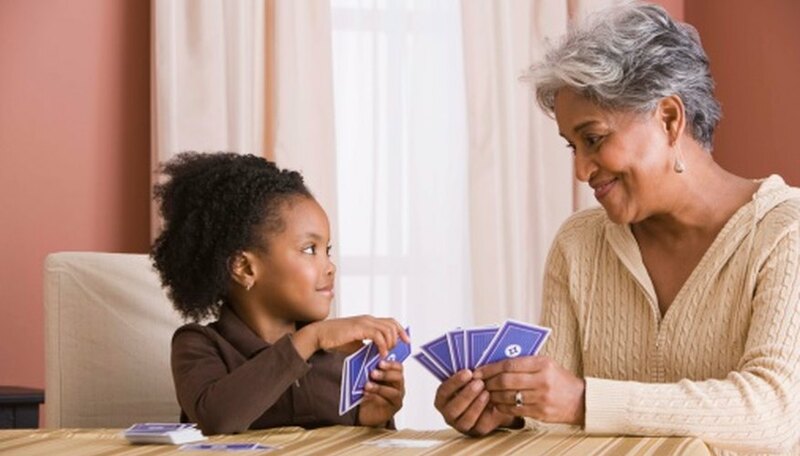 If two people are looking to pass the time with a deck of cards, here is a list of fun and simple games. War is a simple game in which you try to beat your opponent's card number. For example, if your opponent draws a five and you draw a six, you win the round and his card. The object of the game is to capture all of your opponent's cards. If you both draw cards of equal value, draw again without taking the original cards away until someone wins. The person who wins then takes all of the cards. Blackjack can have more than two players but requires a minimum of two. The aim is to get your cards as close to 21 as you can without going over. If you go over, you "bust" and you lose that hand. Each player has two cards to start then they can choose to "hit," which means to draw another card or "stand" which means to stop with what they have. Whoever has the highest number without going over, wins each hand until there are no cards left. The object of Speed is to get rid of your cards as quickly as you possibly can. Unlike other games, you don't take turns. This game relies more on alertness and physical speed. Both players get 20 cards with 12 cards on the table, two piles of 5 cards side by side, with 2 single cards side by side in between the piles. At the same time, each player flips one of the cards in the middle, revealing them. For a player to get rid of one of their cards onto either pile, their card has to match either the suit, or their card has to be the next consecutive card, either going up or down. (Example: If the first card is a 5 of spades, the player may lay down either another spade card or a 4 or 6.) The players do not take turns, rather, they lay down a card as soon as the opportunity presents itself. In order to do this, you will have to lay your cards down faster than your opponent, lest they take the opportunity themselves. The player that reaches zero cards first is the winner. Two-man Solitaire is a variation of the classic game meant for one person. This game is more of a time test, pitting two people against each other to figure out their board first. The object of the game is to get every numerical suite of cards to pile up from their ace foundations; aces are lowest and kings highest. Devin Backman started writing professionally in 2004, with his work appearing in "The Alpenhorn News." He attended San Bernardino Valley College, majoring in journalism.